I purchased a pack of Distress Crayons last month at the Scrapbook Expo and just hadn’t had a ton of time to play with them. Recently Tim Holtz (who made these crayons) did a blog post showcasing them. Typically I don’t care for his style, but I do love his techniques so I thought I’d try this. Especially since I know I have a tag/card swap coming up in May. I found that I had all the supplies to try this in my Mixed Media journal (just an old Smash Book) and with some open time on a Friday afternoon, I decided to create. I’m pleased with my results and found the crayons really easy and fun to use! I’ve watched several artists work with them and the best thing about them is the way that they are packaged. I’m not one for getting terribly messy so these feel good to me. Now I’m excited to make some tags and cards using these techniques. What new tool or technique are you excited to play with? In case you’re interested in the supplies I used here are links to find them on Amazon. Welcome [back] to Make it Monday! Did you arrive here from Connie? Can you believe she’s thinking about Christmas Cards in January? Sometimes it’s just never too late! Last week was a productive digi-scrapping week for me. Some of my layouts were for my responsibilities for the creative teams I work with and I thought you’d like to see them. Snow Play is part of the album I’m working on that’s all about my wonderful canine-child Ginger. I used Laura J Burger Designs Winter Parade digi kit. I just love the blues and purples in this kit. I also used a template from Scrapping with Liz (SwL_TemplateRevisited43). 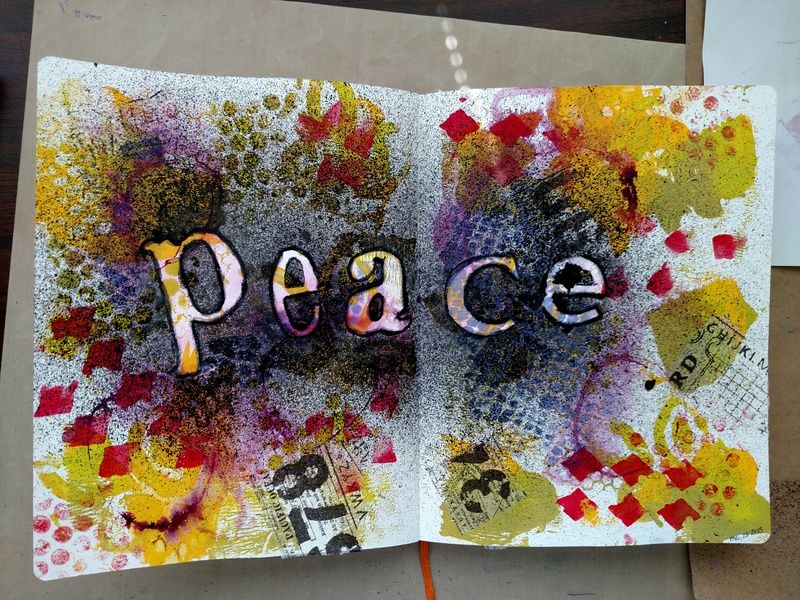 For Jumpstart Designs I created an Art Journaling page using Sherri’s Jumpstart Your January digi-kit. Again, I thought that the colors in this kit were truly wonderful. I also love the variety of papers and embellishments in this kit – check out the tabs, flair and clips! And yes, this Northern CA girl was quite cold that day in New Hampshire! Both designers can be found in the Forever Print Shop. If you do shop there, please remember to include my name as your Ambassador at Checkout. Have you started scrapping your winter or holiday pictures yet? Link us up in the comments so we can give you our oohs and aaahs. Now, hop on over to Alison who’s sharing 5 ways to use up ribbon. Recently I was lucky enough to be in the studio audience at Creative Live in San Francisco supporting a local artist and friend. Andrea Chebleu owns A Work of Heart Studio in San Jose and hosts some terrific classes! She instructed three classes a Creative Live and helped me really take my Art Journaling and Mixed Media skills to another level. We started with How to Create Collage Paper and learning so many ways to turn plain white paper into a wonderful, colorful page! We first learned about making ‘marks’ into paint. We learned simple ways to make our own stamps. From there, we made pages and pages using a Gelli Plate, acrylic paints, stencils, bubble wrap and our own stamps to create layer after layer for beautiful papers. 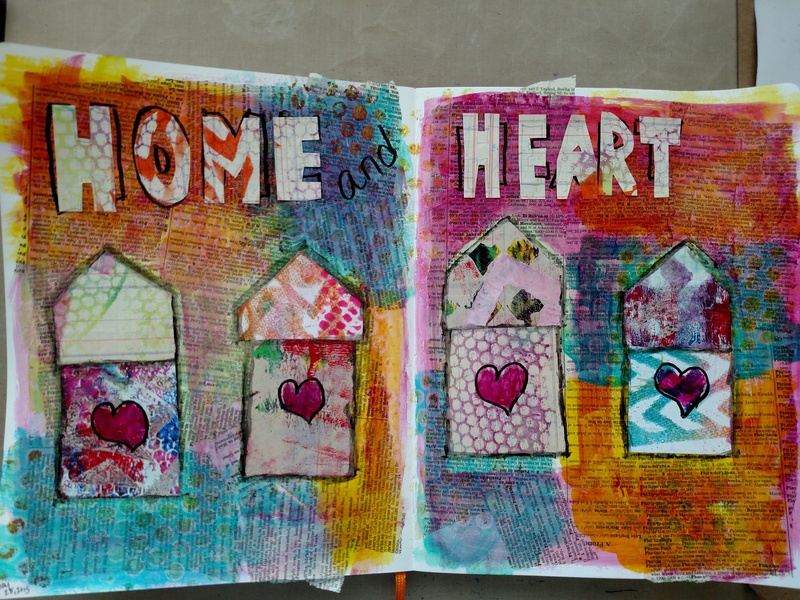 From there, we did an Introduction to Art Journaling. 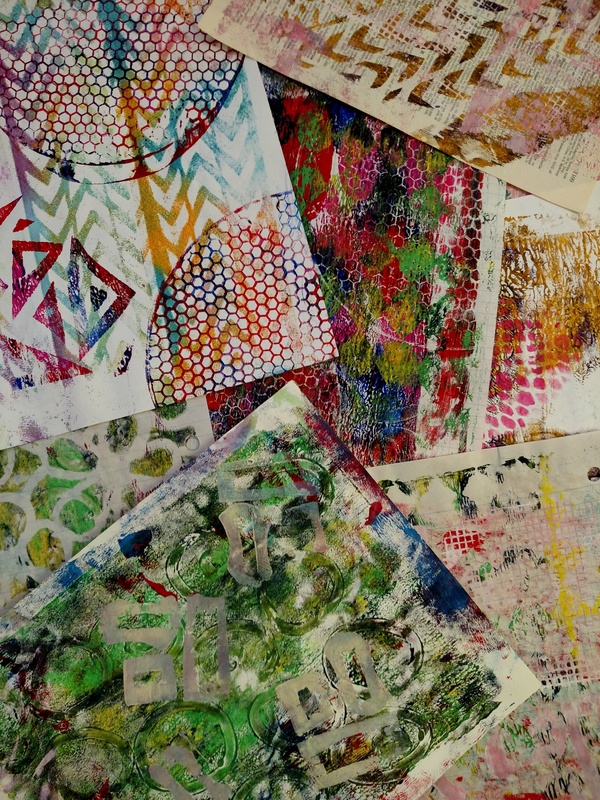 We first created layers on pages in an art journal and added more layers from our handmade collage papers. We then made our pages into mini works of art using masking and collage. Can I just say that this was so much fun? Our last class/project was Recycle your Art. Andrea taught us to take pictures of the best parts of our collage papers and then print those pictures in different sizes from our home printer. Now we can use those printouts as collage paper – yes. Reuse your collage papers. Crazy! This project was a collage (with the photographed collage papers) on a canvas. 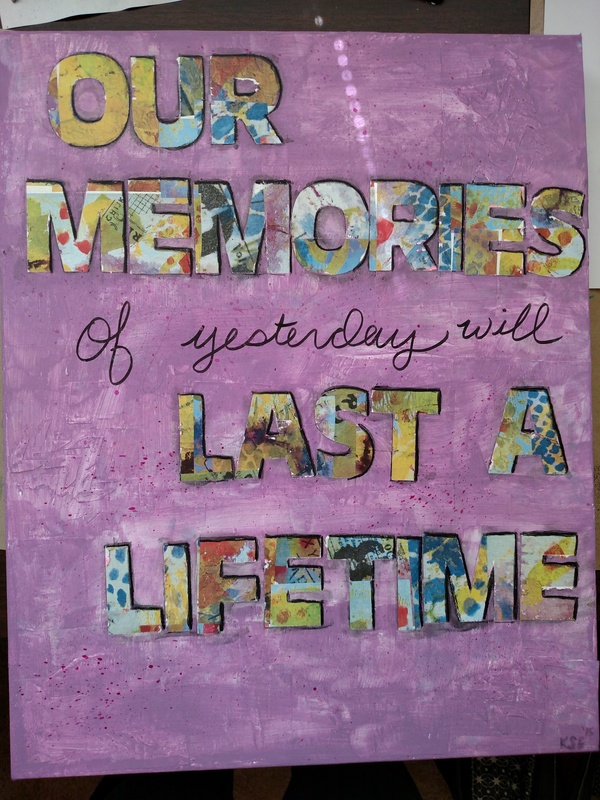 We then put down cut letters as a mask, added some texture paste with a stencil and painted over the entire canvas. We did some highlighting and removed the masked letters to reveal the collage underneath. Each of these classes is now available on Creative Live and totally worth it for learning these fabulous techniques on your own. And if you’re in the San Jose, CA area – go visit Andrea at A Work Heart Studio – she’s great!